Small batch made brown leather suspenders by Project TransAction. Hand cut from strong and supple 5/6 oz. oil tanned top-grain American cowhide, these suspenders are fully stitched for a professional look and feel. Dual chest height roller buckles allow the front straps to easily adjust; Y-back connects with solid welded O-ring. 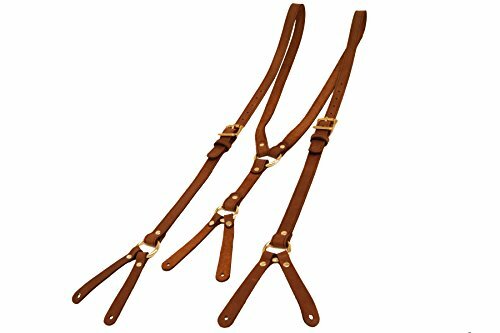 All standard suspenders are available in 3/4" or 1" width and come with your choice of trigger snap, suspender clip, or buttonhole end style, as well as your choice of nickel plated steel, natural brass, or antique brass hardware. Great for work or play. Made to last. If you have any questions about this product by Project Transaction, contact us by completing and submitting the form below. If you are looking for a specif part number, please include it with your message.